Best Tasting Protein Bars – Working on Tasting them All! Working on Tasting them All! My brother and I attempted to find the Best Tasting Protein Bars. We went to our local Wal-Mart, and just grabbed all the bars that looked remotely yummy! I’ve added our descriptions and what we think is the best tasting protein bar, and pictures so you can see what the bar actually looks like and basic nutritional information so you can easily compare at the total protein, total carbs, total fat, calories and total weight. When I go hiking on a trail, my favourite snacks to bring are Apples, Trail mix and Protein Bars - of course I want the Best Tasting Protein Bars. So, here are some that I’ve tried and my opinion of the taste. I will continually be adding more bars because this is a delicious endeavor… so keep coming back! Or, even better, share your favourite bar! Overall, we were pretty impressed with most of the bars, so they are in no particular order. To try them, purchase a single bar, but once you know what you like, buy them in bulk online and save money! I've also included some links to purchase the best tasting protein bars in bulk to save money (cause we all know that saving money makes them taste even better). 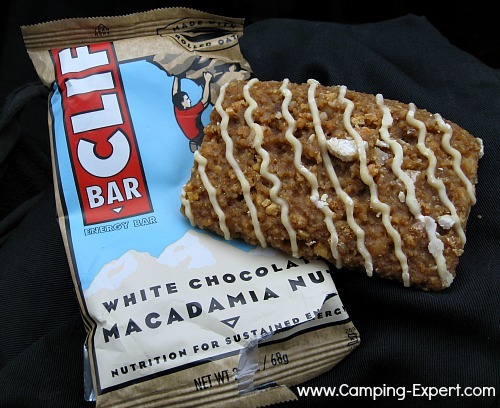 Clif Bars are common camping nutrition bars. They have alot of carbs for the amount of calories, but this is good for hiking and energy. Protein 9g, Total Carb 44g, Total fat 4.5g, Total grams g, Calories 230. 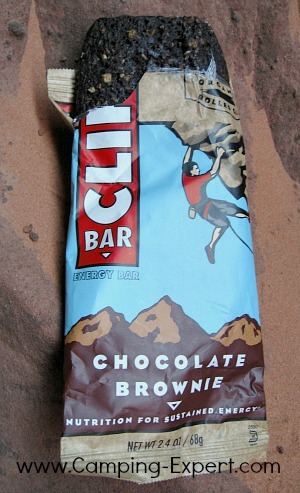 It tastes like a dehydrated or dry brownie with nuts. Ie. Concentrated Brownie with goodness! Overall, this bar has a lot of carbs, which is good for quick energy, but not as much protein compared to some of the other brands. Protein 9g, Total Carb 41g, Total fat 7g, Total grams 68g, Calories 250. Tastes yummy. The bar tastes like a cross between a macadamia cookie and a granola bar. Has a decent amount of calories. Alot of calories for the amount of protein in the bar. Good for energy, or a small snack with many complex carbs. 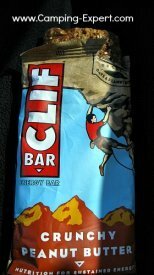 Clif Crunch Bar, White Chocolate Macadamia Nut, Buy 10 for 3.99 Crunch has about half the protein. Bar has a lot of calories and carbs for the amount of protein. If you like peanut butter this is a good choice. But keep away if you have peanut allergies! Power Bars have more Protein for the amount of calories that they contain, plus they don’t have too many grams of fat or carbs which means that they’ll last long and give you stay power and wont wear off quickly. Plus they’re heavier and larger size means that they’re a big snack. Protein 20g, Total Carb 25g, Total fat 6g, Total grams 60g, Calories 210. My brothers description: Nothingness surrounded by chocolate. To me it tastes like protein with chocolate, thus there really wasn’t a lot of flavor coming from the middle part, which was supposed to be peanut butter. Not overly impressed with the flavour (or lack there of). Lots of Protein, especially for the amount of calories and carbs! Protein 20g, Total Carb 27g, Total fat 5g, Total grams 60g, Calories 210. More impressed with this bar. Good tasting bar. Not too dry (compared to some power bars). The yogurt gives it some moisture. Decent aftertaste. The yogurt adds a nice touch. Decent total amount of protein. Kashi is pretty well known for making protein foods from breakfast cereals to protein bars. Protein 23g, Total Carb 38g, Total fat 6g, Total grams 78g, Calories 300. If you like the taste of coffee and chocolate than this bar is for you. The coffee flavor is accented by the chocolate in a chewy bar. Yummy! I am quite a fan of Nature Valley. The bars aren't huge, but they are pretty reasonably priced, and all taste very good. These bars we went back for and bought more. They're like their lower protein bars, but with longer lasting power and less sugar. Overall a win! Protein 10g, Total Carb 14g, Total fat 12g, Total grams 40g, Calories 190. Love this one- Top of our list of Best Tasting Protein Bars. A bit fatty, but overall amazing and really good taste (and price). This one is quite sweet. It tastes similar to the sweet and salty bars that they make, which are delicious, but with more staying power and it seems like it has a bit less sugar. Good source of healthy fat and protein. More fat than some other bars for the size, which probably makes them taste good. Don’t’ eat too many, but good if you’re active! Decently price, which makes me happy. This one is similar to the chocolate almond, but with the flavor of peanut butter thrown in. Very yummy. Protein 12g, Total Carb 22g, Total fat 6g, Total grams 45g, Calories 190. This is a delicious bar! Another on the top of our list of Best Tasting Protein Bars. Yum Yum. Tastes like a chocolaty bar, that’s healthy for you! If you love chocolate, then you’ll love this. Luna has a good variety of different tasting nutrition bars. Overall they're quite delicious. Quite a few carbs, but many different flavours. And they do a good job with the variety of flavours. Protein 9g, Total Carb 27g, Total fat 5g, Total grams 48g, Calories 180. 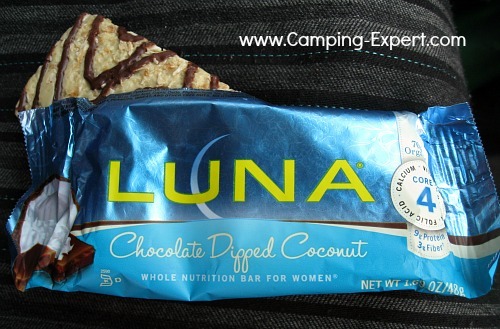 This Luna Bar has a tart flavor. A very strong lemon flavor, so if you love lemon, then this is for you! Protein 12g, Total Carb 19g, Total fat 8g, Total grams 45g, Calories 190. Gluten Free. Tastes like chocolate peanut butter, exactly what it’s called. The flavor was a little bit bitter. Quite a bit of fat for the size of the bar, not too many carbs. Decent protein amount for the size of the bar. Protein 9g, Total Carb 25g, Total fat 6g, Total grams 48g, Calories 180. This bar tastes exactly like what the bar says. Nuts and Chocolate. Very yummy. No surprises. No aftertaste. Well liked. Protein 9g, Total Carb 15g, Total fat 7g, Total grams 48g, Calories 190. Very yummy. If you don’t like Coconut though, it’s probably not for you. Have A Favourite Protein or Granola Bar? Do you have a a favourite protein bar? Share it! Your favourite AND description will appear on a Web page exactly the way you enter it here. You can wrap a word in square brackets to make it appear bold. For example [my story] would show as my story on the Web page containing your story. I hope that these descriptions helped you to find a new best tasting protein bars.